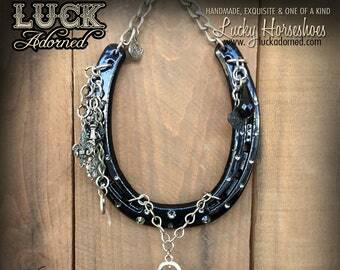 Welcome to Luck Adorned(TM) - Exquisitely decorated and one of a kind lucky horseshoes. Made with Love & Luck(TM) by myself and my husband in our Old Town, San Diego studio. Horseshoes have been known for many years as a universal symbol of good luck and make great gifts for any occasion. . We love custom orders and are happy to create a custom designed shoe for you (please note custom orders typically take 2-3 weeks). Horseshoes make great and unique gifts for any occasion. Weddings, Birthdays, Christmas, Valentine's Day, New baby, Baptisms, Housewarming, Graduation, Retirement, Anniversary, Going Away gift, Off to College, traditional gift for the Bride, Halloween and so much more. Thanks for visiting our Luck Adorned store on Etsy! ****Don't forget to visit our website for even more great stuff! 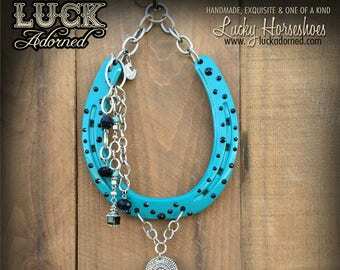 www.LuckAdorned.com. You can check out all of our styles, see the local rescues we work with, see our gallery of past designs, find out which shows we'll be attending AND, don't forget to SIGN UP ON OUR MAILING LIST while you're there! LUCKY HORSESHOE, horseshoe art, horseshoe, Christmas, good luck, unique gift, wall art, decorated horseshoe, one of a kind. LUCKY HORSESHOE, horseshoe art, wall decor, black horseshoe, lightning bolt, good luck, unique gift, rustic wall art, equine art, horse. LUCKY HORSESHOE, horseshoe art, wall decor, black horseshoe, steam punk, good luck, unique gift, rustic wall art, equine art, horse. I Love my Peacock Dreams Horseshoe! It's classy, Country and Spiritual, all rolled into a beautiful work of art! Super-fast shipping and beautiful presentation. I highly recommend this Etsy artist and shop! This lucky horseshoe turned out absolutely beautiful! I'm going to display it in a prominate spot so others can enjoy it as well as myself. Thanks for the great workmanship! This is our studio in Old Town. Here's what happens to I bring the work home. And this too. Who knew a bed could double as a work bench? This is Chloe. My support group at home. I swear, she's supervising. Stage 5 of the rust process. Horseshoes kept piling up to be thrown away at the ranch we board at so I decided it was time to do some serious upcycling and put my twist on things. I had a vision of how I wanted them to look and since horseshoe art has been around for many years and there are so many incredible and wonderful pieces out there, I really wanted to do something that was different. I have always liked my art to stand out in some way, so I spent the first year or so hunting for unique pieces, building my inventory and researching different applications and finishes that would hold the test of time. I have found that I design each shoe around the pieces I find and I get so excited when I see the shoe finally coming together! They are very similar to doing a painting in some ways and seeing them go to different people with different stories means the world to me. I love doing shows and being able to talk to people and hear what each shoe represent to each person. I have laughed, cried and shared some precious moments with people over a horseshoe and it has touched my heart in ways I am forever grateful. I made the first few shoes for some very special friends, did a few shows and finally got an Etsy site and website up and going. I have since managed to pull my wonderful husband, an amazing artist in his own right, into the mix and now he is happily designing shoes alongside me. Whether you are looking for a gift for yourself or for someone special, I hope you find a Luck Adorned horseshoe that touches your heart and moves your soul. If you have a vision of your own, have a special horseshoe from a beloved 4 legged friend, I would be honored to design something just for you. Just send me a message here on our etsy store or email me at LuckAdorned [!at] gmail.com. All designs © copyright 2011-2015, Luck Adorned. All rights reserved.